Hacks to keep yourself warm at your winter wedding! We gathered some tips and tricks so that winter brides don’t die of a frostbite! Rum rum rum rum rum oh Whiskey! Ask your BFF to sneak in some whiskey so that you can sip on it between intervals. You can trust on some good ol’ whiskey to keep you warm! 3. Leg Warmers all the way! Leg warmers underneath your lehenga is great way to keep yourself warm! Full sleeves blouse are back in fashion so why not opt one for your winter wedding? My friend once suggested a warm concoction for my cold and sore throat. It kept me warm throughout the day! Grate some ginger in boiling water. Strain it, add some haldi and honey to it. Drink up! You can drink it several times during the day. 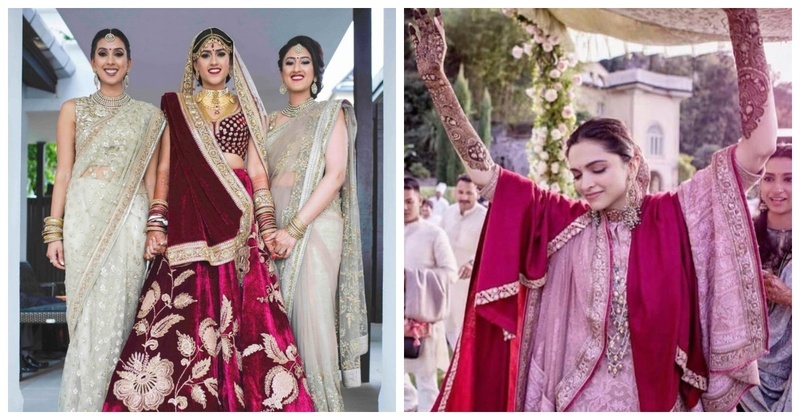 Wear a velvet lehenga on your wedding. The material will keep you warm. As you can’t layer yourself in jackets (it isn’t a cardinal rule) you can always wear two dupattas. Adding up the layers! Wear long sharara jackets and say no to cold! Drape a shawl over yourself in a classy style not dadi amma style! Just cause you’re the bride, doesn’t mean you should remain hungry! Stuff yourself with all sorts of food that comes your way. Also carry some marshmallows on a stick to roast on the havan fire! Winter is coming, but so is your wedding!